Regular Followers of this blog know I have a penchant for history. So I can't let this month go by without remarking on the centenary of Einstein's theory of relativity. 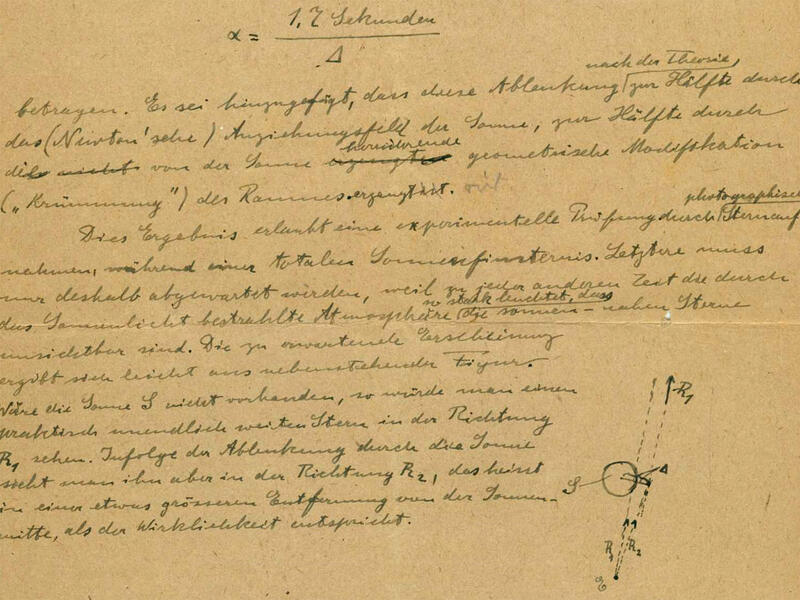 It was in November 1915 that he finished Die Grundlage der allgemeinen Relitivatätstheorie and sent it to the prestigious printer, Johann Ambrosius Barth, in Leipzig. It was published the following year. In those days Leipzig was the Mecca of German scientific publishing and German was the dominant language of science. Until World War II, PhD candidates in the sciences were expected to have a knowledge of German. Therefore the fact that Einstein published in German was not such a drawback as it would be today and by 1919 the book was enormously famous in scientific circles. Nevertheless it was generally felt by publishers that an English translation was needed for the American and British markets. The translator appointed was Robert W. Lawson, MSc., a lecturer and member of the Physics Laboratory at the University of Sheffield in England. In British universities, lecturer is equivalent to North American assistant professor. Note too that Lawson had an MSc., not a PhD. Until World War II the MA/MSc was considered a terminal degree in the UK, not the stepping stone to something higher as it is today. (When I was a student, the leading British linguist of his day, J R Firth, was appointed Professor of Linguistics in London with an MA.) Lawson was well known as a physicist. From 1913 he was an honorary Assistent (assistant lecturer) at the Vienna Radium Institute. Lawson set to work in 1919 and in August 1920 his translation came out in London and New York. There was already a second edition the same year and three further editions within two years. It's still the standard English version (see Amazon, etc.) and the one that's most read today in any language. It's one answer to the age-old question: Is it better to have a technical text translated by a translator who knows the subject or by a subject specialist who knows the languages? It's doubtful whether it could have been done so successfully in 1919 by someone who didn't have advanced training in physics. But where did Lawson learn such good German? He had taught in Vienna and he is said to have polished his German while a prisoner of war in Austria. He went on to translate a couple of other scientific books (see References). I haven't managed to find out more about him. Perhaps one of you knows something. How did Lawson meet up with Einstein in the first place and obtain his approval? Shortly after the success of the eclipse expeditions to the South Atlantic in 1917 which proved part of Einstein's theory – another British contribution to Einstein's fame – Lawson wrote to him on behalf of the editor of the leading British science journal Nature asking him for a popular short article explaining his theories. A month later, Einstein told Lawson that the article was almost ready but it was probably too long, and he went on to prepare a shorter one. The first version was never published, but it was the beginning of their relationship. "as intelligible as possible to the ordinary man. Our travellers [i.e., salesmen] tell us that there is complete ignorance in the public mind as to what Relativity means. A good many people seem to think that the book deals with the relations between the sexes." "In your schooldays most of you who read this book made acquaintance with the noble building of Euclid's geometry, and you remember – perhaps with more respect than love – the magnificent structure, on the lofty staircase of which you were chased about for uncounted hours by conscientious teachers. By reason of your past experience, you would certainly regard every one with disdain who should pronounce even the most out-of-the-way proposition of this science to be untrue. But perhaps this feeling of proud certainty would leave you immediately if some one were to ask you: 'What then do you mean by the assertion that these propositions are true?' Let us proceed to give this question a little consideration,"
For Einstein, Lawson did more than translate. He thought the book would be accepted better if its author could provide a proof of the general theory. So Einstein wrote a six-page paper for him in just a few hours and sent the manuscript to him in Sheffield. 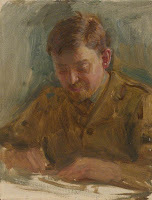 Lawson used it as an appendix to the book and kept the manuscript as a souvenir of his relationship with the great man. At the time of writing this post, the Einstein-Lawson papers are on display at Oglethorpe Museum of Art in Atlanta, Georgia. USA. Lawson deserves credit in any history of science translation. Though Sheffield started translation courses early on, there is no indication that Lawson ever took such a course. He began as a typical Native Translator. Lawson's wasn't the only English translation of Einstein published in 1920. There was also one by M. N. Saha and S. N. Bose (of boson particle fame), physicists at the University of Calcutta. But it was too remote to have a readership like Lawson's. Nevertheless it illustrates the universality of translation as well as the high standard of mathematics in an Indian university of the period. Einstein rewarded Bose by recommending him for a post at the University of Dhaka even though he didn't have a doctorate. Until Einstein came along, the dominant figure in mathematics and mechanics was still Isaac Newton (1643-1727). But Newton wrote in Latin and his magnum opus, the Principia, wasn't translated into English until 1729. The translator was another Native Translator, Andrew Motte, a London maths teacher. It was done during the transition from Latin as the universal language of science towards the European vernaculars and it's still Motte's version that's mostly read today. Meanwhile Einstein could have read it in German. A. Einstein. Die Grundlage der allgemeinen Relativatätstheorie. Leipzig: Johann Ambrosius Barth, 1916. Published in Annalen der Physik, 4. Folge, Band 49, 1916, and as a separate offprint. Copies sell today for several thousand dollars. Albert Einstein (University of Berlin). Relativity: the special and general theory. Authorised translation by Robert William Lawson (Physics Laboratory, University of Sheffield). London: Methuen and New York: Holt, 1920. Albert Einstein. Relativity: the Special & General Theory. 100th Anniversary Edition. With commentaries and background material by Hanoch Gutfreund and Jürgen Renn. UK and USA: Princeton University Press, 2015. This edition gives due importance to the role of Lawson. Shelby Linerdman . Einstein papers at Atlanta's Oglethorpe still relative. WABE, Atlanta, 2015. http://news.wabe.org/post/einstein-papers-atlanta-s-oglethorpe-still-relative. Johann Ambrosius Barth Verlag. Wikipedia (German edition), 2015. Arthur Erich Haas. The New Physics. Authorised translation by Robert W. Lawson. London: Methuen, 1923. Georg von Hevesy. Manual of Radioactivity. Translated by Robert W. Lawson. London: Humphrey Milford, 1926. A. Einstein and H. Minkowski: The Principle of Relativity: Original Papers. Translated ino English by M. N. Saha and S. N. Bose. University of Calcutta, 1920. Sir Isaac Newton. The Mathematical Principles of Natural Philosophy. Translated into English by Andrew Motte. London: Benjamin Motte (Andrew's brother), 1729. https://en.wikisource.org/wiki/The_Mathematical_Principles_of_Natural_Philosophy_(1729)/Title_Page. Jakob Philipp Wolfers. Sir Isaac Newton's Mathematische Principien der Naturlehre mit Bemerkungen und Erläuterungen. Berlin: Oppenheim, 1872. 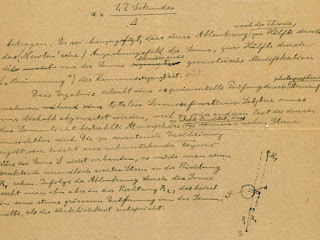 Page from one of Einstein's communications to Lawson. Source: Linerdman. If you are a regular Follower of this blog you have already been introduced to the organization in England that runs a movement for training child interpreters in schools. If not, enter emtas in the Search box on the right. It's the Young Interpreter Scheme of the Hampshire County Council (EMTAS) under the direction of Astrid Dinneen. Their latest Newsletter (November 2015) has just arrived. It emphasizes the aids YI offers to teachers who want to set up a scheme in their own schools. YI is not confined to the UK; it already has a few followers in other countries. YI's aims are twofold. On the one hand an immediately practical one of providing communication between school communities with minority languages and English; and on the other, to encourage children and adolescents to express themselves and develop their personalities in their 'heritage' cultures. Many people don't realize what a multilingual and multicultural country England has become. When I go back and visit my old school there, I see the building hasn't changed much, but oh! the pupils. There is also another aspect that should interest even the community of professional interpreters. Interpreting is a skill. Like any skill – be it languages, music or football – the younger you start practising it the better. And so it is with potential Expert Interpreters: Start 'em young. The notion that interpreting can only be taught to adults and after extensive education, even a university degree, is out of date. Of course the would-be Expert Interpreter has much to learn, not only linguistically but about the world. Yet there are basic components of the skill, for example speed of thought transfer, that can be practised with pleasure and amusement from childhood. You may well wonder what this question means. Let's call the characters in which a language is written its script. The script of English is the familiar so-called Latin alphabet in which this blog is displayed. A person who habitually speaks more than one language is said to be bilingual or multilingual. But how about a person who writes in more than one script? The term for that is biscriptal. It's much less known than bilingual: there are over 76 million Google mentions of bilingual compared with only 2,340 for biscriptal, a drop in the ocean for Google (though many of the references to bilingual subsume biscriptal). The disparity is indicative of the relatively little research that's been done on biscriptals. There are two main reasons for being biscriptal. One is that you are bilingual in two languages each of which uses a different script. Thus, if you are English and you learn Russian you will inevitably end up being biscriptal in the Latin and Cyrillic alphabets. On the other hand a person can be biscriptal in a single language if it uses more than one script. The language most often cited by far in the Google mentions of biscriptal is Chinese. Contemporary Chinese is actually triscriptal: there are the Traditional Chinese characters that are still the norm in Taiwan, Hong Kong and Macau; the Simplified Chinese characters that have replaced the former on the mainland since the Communists took over; and Pinyin, the official phonetic system for transcribing the Mandarin pronunciations of Chinese characters into the Latin alphabet in China, Taiwan and Singapore. Let's call the former type (two languages) interlingual biscriptalism and the latter type (same language) intralingual biscriptalism. A classic example of a biscriptal language was Ancient Egyptian and the most famous example of it is the Rosetta Stone, the original of which you can and should admire in the British Museum in London. It's a key document in the history of translation as well as of archeology. The Stone has three texts engraved on it. One is in Greek, which by the time of the Stone, 196 BC, was the language of government in Ptolemaic Egypt. The other two are the same translation of the Greek text into Egyptian – but in two different scripts. The better known of them is hieroglyphics, a semi-pictorial script, because it is the script carved on monuments and is more artistic. The other script is Demotic, which was much simpler to and faster to write than hieroglyphics and was therefore used by the scribes for the thousands of non-religious papyrus documents (contracts, etc.) that have come down to us. This doesn't mean that all literate Egyptians knew the two scripts (i.e., were individually biscriptal), but that Ptolemaic Egypt was institutionally bilingual and biscriptal. Many of the questions we ask about spoken bilingualism can also be asked about biscriptalism. How are the different scripts stored in the brain? Is there interference? Does it impede children's learning, and so on? If we take another look at the Google citations we find that most of them that are not about Chinese are about dyslexia. There's plenty of scope for further research into the psychology of biscriptals. Nevertheless, there's one thing that's not the same in bilingualism and biscriptalism: the latter can't be natural in the way bilingualism and translation can. This is because writing isn't natural. We don't pick it up as soon as we can talk or draw. We have to go to school to learn it. How about if we convert one script into another script, for instance if we 'Romanize' Russian for an English library catalogue. Is it a form of translation? Catford (see References) considered that it was: it represented the graphemic level of translation. But we have other words for it: transcription, transliteration, Romanization; so it's clearer to keep it apart. Transliteration often involves much more than just changing the shapes of the characters. 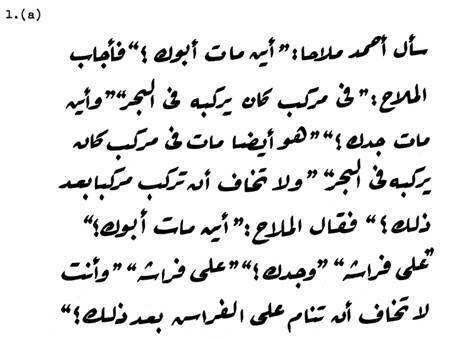 Arabic, for instance, has no capitals and no block letters; it's all cursive and it's written from right to left. I myself am interlingually biscriptal in Latin and Arabic. I am also intralingually biscriptal in several varieties of Latin. My computer keyboard,like most of them in Spain, has the characters, extra characters (ñ, ç) and diacitics (accents) needed for English, French, Spanish and Catalan. And I can do a fair rendering of both ruq'ah and naskh styles in Arabic. Beginners learning Arabic as a second language are usually not taught how to write it like an Arab, with the result that they imitate what they see in printed books and write like a young school child. 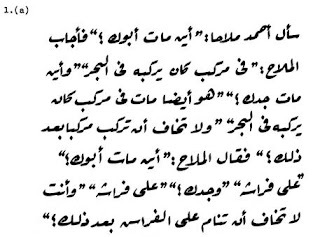 The script in most printed books is a modification of naskh that was devised long ago to facilitate manual typesetting (see Images). I made that mistake until I took a course with the late T. F. Mitchell (see References). He even made us put aside our ball pens and fountain pens and sharpen our own broadnibbed reed pens - which raises another aspect of biscriptalism, its instruments. He had been a graduate student under the British linguist J R Firth, who "constantly emphasized the basic linguistic importance of the study of 'letters'," and who famously said that if you didn't learn to write a second language properly you would always write it with a foreign accent. Simplified Chinese characters. Wikipedia, 2015. History and Utilization. New York: Wiley, 1978. The 'Bible' on ths subject. Applied Linguistics. London: Oxford University Press, 1965. Catford was another of Firth's students. 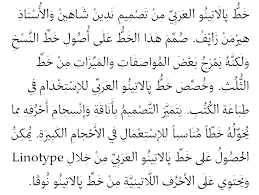 Upper: Linotype Arabic for printed books. All ligatures between letters on same line. Dots on letters (points in English, nuqat in Arabic) are distinct. Little contrast between thick and thin strokes. Source: www.myeasyarabic.com. Lower: Arabic ruq'ah script. Words slant downwards from right to left. Points fused into short bars. Contrasting thick and thin strokes. Source: www.scripview.com. NPIT3, Zurich, 5-7 May 2016. International forum for Non-Professional Interpreting and Translation, the latest paradigm in translation studies. http://www.zhaw.ch/linguistics/npit3. When you get to an advanced age you become aware that your relatives and friends are falling like ninepins. Thus it was with sorrow and nostalgia that I heard last week of the death of Michel Limbos, a prominent member of the Ottawa translation and interpretation community. It's true that since I moved to Spain nearly two decades ago I had lost all contact with him, but in the 1980s we worked closely together. I knew him in two of his roles. He was year after year a reliable teacher in our undergraduate translator training program at the University of Ottawa, where it was our policy to employ professional non-academic translators as instructors. And more personally he was my valued booth colleague on conference interpreter assignments. He had a quality that made him very pleasant to work with: his courteousness. He illustrated that the best interpreters have qualities besides the linguistic ones. He was a man of the world, having been born in Africa, educated in Belgium, and come to Canada as one of the generation that was recruited in the drive for bilingualism and better French. When he was translation manager at the Canadian Export Development he was also my employer for a while in the mid 1980s. At EDC he ran one of the few services in Canada for Spanish translation; however it was for French that he set me to interpret EDC's monthly country-by-country creditworthiness meetings for the Senior Management Committee. These were very lively presentations by a French economist. I learnt a lot from it, so I was grateful for the opportunity. The two strands, interpreting and the School of Translators, came together in an incident that brought out another of his qualities: his loyalty. When we started the interpreter training degree we put into it a component a compulsory on-the-job experience period which we called the practicum. It was very unusual at the time but we were encouraged by the success we'd already had with practicums for written translation. Practicums are valuable in interpreter training courses for several reasons, and one of them is that conference interpreting is a performance. It may be performed before a small group or it may, these, days, be broadcast to millions. Either way, you have to overcome stage fright. So to give our students the necessary 'baptism of fire', we used to organize conference teams ourselves and hire them out. However, we put strict conditions on this activity, and one of them was that the students must always be accompanied by an experienced professional to counsel them and to take over if they broke down. Unfortunately this procedure ran into vehement opposition from some of the members of a certain leading association of professional interpreters. They threatened to blackball our students and they made it difficult for us to recruit supervisors. But Michel and another interpreter (Jacqueline Mejias) stood by us. Eventually the association in question admitted Michel, but that was many years later at the end of his career. He also stood by me in my painful relationship with the board of ATIO, of which I was president at the time. On one occasion he was the only member who turned up on time for the meeting, while the others were in cabal outside. Thank you Michel. I will not forget you.